Congratulations to the winners of the Pi Day competition!! 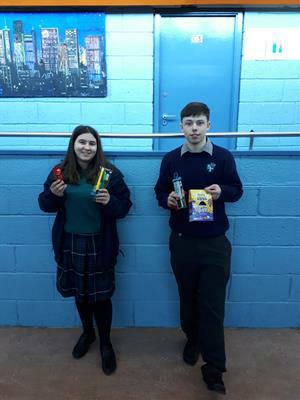 1st place Cody Dullard who remembered 48 numbers, 2nd place Coline Bischoff with 38 numbers (absent for photo) and 3rd place Marta Cepanac with 33 numbers. 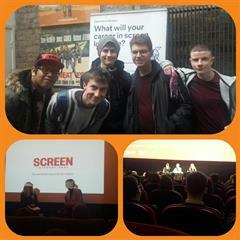 Fifth Year students attending the Careers in Film day at the Irish Film Institute. Congratulations to Ms. O'Rourke's science class for completing the Junior Achievers STEM activities with Paul. They had great fun and learned so much! 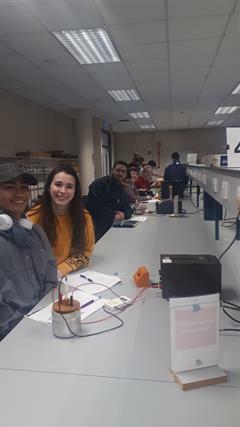 The 6th year physics students got to experience college life this January, enjoying a day out at NUI Maynooth's Lab Day. On December 11th the fifth year art classes and their two teachers visited five different galleries and museums on their Art Tour of Dublin.